Lindiwe Mabuza is a poet who has served as the African National Congress’ Chief Representative to Sweden and the United States, as well as the South African Ambassador to Germany. 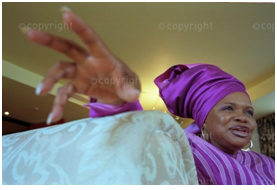 She garnered international support for the liberation struggle, working for economic sanctions and cultural boycotts. As a writer, Mabuza also used her skill with the written word to take part in multiple collections meant to empower South African women writers such as Malibongwe and One Never Knows. Lindiwe Mabuza, 03 December 2005. Photograph by John Robinson/South Photographs. Permission: Africa Media Online. Lindiwe Mabuza was born in 1939 in Newcastle, Natal (now KwaZulu-Natal), South Africa. Mabuza had a childhood no different from the majority of Black South Africans at the time. Her family of seven fought to get by on what meagre means they had. They struggled to obtain the most basic necessities of life, such as coal and shoes, and often times were forced to do without. This was in no way a reflection of her parents’ efforts, though. Her father, who worked as a truck driver, and her mother, who was a domestic worker, worked hard for their family, but the cards were not in their favour. Mabuza, however, after experiencing this so early in her life, saw that the best way to change their situation was to seek an education. Mabuza’s grandmother must be credited for emphasising the importance of education as a means to overcome the situation she found herself in. She recalls her grandmother taking in children off the streets and tutoring them. Mabuza remembers her grandmother’s house being full of children reading by the light of kerosene lamps all hours of the morning and evening. Growing up around a grandmother with such a zest for education, how could Mabuza not have sought it with all that she had? South Africa. However, she did not begin writing until much later. Lindiwe Mabuza with Hugh Robertson, 1938. George Hallett/South Photographs. Permission: Africa Media Online. After high school, in the 1950s, Mabuza decided to leave South Africa to continue her education. She first attended college in the United States of America, studying home economics at Ohio’s Grailville Community College. Afterwards, she attended Roma College in Lesotho, receiving a B.A. degree there. She chose to enroll here so that she could expand her knowledge of African culture. Suspending her career as a student, Mabuza then turned to teaching, having returned home in 1961. Mabuza first applied for a position in Vryheid, South Africa but did not receive it. This was just after the Sharpeville massacre in 1960, after which previously multi-racial universities were segregated and many non-white teachers resigned. This led Mabuza to turn, once again, to foreign education. She taught English and Zulu literature at a university in Swaziland. After this teaching stint, in 1964, Mabuza returned to America to earn a graduate degree in English from Stanford University in California and another in American Studies from the University of Minnesota. After receiving two graduate degrees, Mabuza returned to teaching, now as a professor at the University of Minnesota. Mabuza, however, did not stick to conventional means of promoting education. She took on the Way Community Project while teaching at the University of Minnesota, which stretched her mind to such lengths that it, in fact, could be argued to have made her the person we know her as today. The Way Community Project was designed to utilize education as a means of keeping Minnesotan children off the streets and out of trouble during the summer months. Though Mabuza originally attempted to teach the students literature by traditional means, she soon found this strategy to be ineffective. Instead, she switched to a more creative method: she challenged the students to write a creative story about what they would do with one million dollars. Mabuza found herself drawn into the challenge; she says this is what originally prompted her to start writing. The poverty Mabuza lived in as she grew up set the stage for her eventual entrance into politics. She claims that she was ‘born into the struggle’. The conditions she was surrounded by as a child living in a segregated world essentially meant that every choice she made, whether she realized it or not, would be a political choice at heart. She recalls instances in which she saw White children playing in a community pool but not being able to join in. Instead, she and her siblings would swim in the local rivers. This struggle, which led to an inevitable freedom movement in South Africa, coupled with the parallel struggle for African American rights Mabuza experienced firsthand while in the USA, prompted Mabuza to take a more proactive role in the liberation struggle of her own country. She says that witnessing ‘the civil rights movement and the women's rights movement gave her courage to go back to her country to try to help her people struggle for what is rightfully theirs’. She joined the African National Congress (ANC) in 1975, most likely while in the U.S.A, a choice that would affect the rest of her life. Shortly after joining the ANC, Mabuza was quickly appointed to work as a journalist for Radio Freedom, an underground radio station for the liberation struggle, and as an editor for Voice of Women, a journal written by African women. Her newfound political allegiances found expressions in her writing. Mabuza soon wrote a poem in 1976 in the context of the Soweto Uprising, entitled ‘To whom it may concern’. In it, she speaks of the hope Africans have in the future and warns the enemy of this, saying ‘Just remember this our pain will pass / Where will you be?’ The poem, though short, delivers quite the punch, warning the oppressors and empowering the students involved in the Soweto Uprising. When Mabuza joined the ANC in the seventies, the culture at the time did not empower women to write. In fact, women were told much the opposite—that they could not or should not be writing, even within the liberation movement of the ANC. Mabuza saw the importance the written, poetic word could play in the liberation struggle, calling poetry a ‘part of a whole arsenal of weaponry to be used against apartheid’. This spurred Mabuza and two of her colleagues to change the stigma that kept women from writing. They sent out a plea for ANC women to write poetry. The three received many submissions that spoke on new topics in a unique light. Eventually, they edited and compiled these into an anthology that came to be known as Malibongwe, which was published in 1980. Mabuza speaks to the importance of this, saying that their ‘first obligation is to let the world know that the women of South Africa have an opinion’. After all, how can liberation be won for any people (both Africans as a whole and women specifically) if the voices of that group are not heard? This was the critical step Mabuza and her colleagues took to empower South African women. This may also be the anthology in which Mabuza launched her own writing, through a poem entitled ‘Letter to Letta,’ a tribute to her friend, Letta Mbulu, a South African musician. Later on, a collection of Mabuza’s poems entitled Letter to Let-ta was published in South Africa. In 1979 Mabuza left Africa to take her work abroad once again, after having left America only two years’ prior. The ANC called upon her to be its chief representative in Sweden. While there, she participated in political talks with Nordic governments and various religious groups and trade unions about imposing sanctions against South Africa and garnering other forms of support for the ANC. Gradually, Mabuza says, the scope of the ANC’s objectives expanded as they realized a wider range of needs, including adequate education within South Africa (rather than South Africans being forced to leave the country in order to receive an adequate education, as Mabuza was forced to do). These needs eventually built upon each other. She adds, however, that none of this would have been possible without increasing support from other countries, as well as the Nordic countries she was working within. During the 1970s and 1980s, the government of South Africa infiltrated ANC locations across the world, sabotaging their offices and killing global ANC leaders. While Mabuza was the Chief Representative in Sweden, the ANC office in Stockholm was bombed. Fortunately, Mabuza survived the bombing, and went on to continue her work. While in Sweden, Mabuza’s work not only consisted of gaining economic and political support for the anti-apartheid struggle; she, as evidenced by her earlier accomplishments, was greatly focused on the cultural struggle within South Africa. In 1977, before her work in Sweden began, Mabuza headed a cultural committee in the ANC. When she took on her post in Sweden, she hoped to use her newfound position to increase its influence. As cultural workers against apartheid, Mabuza and others tried to balance pure isolation of groups that supported apartheid, boycotting their performances, and promotion of groups against apartheid. The international cultural boycott of South Africa first began nine years’ prior, in 1968, after the apartheid regime had gone abroad to garner cultural and academic-based support. Such a boycott was designed to destroy the regime’s façade that their government really was not as bad as it seemed. When Mabuza helped bring this cultural struggle to the Nordic countries, she and her colleagues worked to have anti-apartheid performers, such as Miriam Makeba, visit, while attempting to keep other performers who were not anti-apartheid, such as The Drakensberg’s Boys Choir, from getting on stage. After garnering support from the Nordic countries, Mabuza then used her influence to help bring Amandla, a cultural African group, to Scandinavia, as well as Holland and Germany. Exiled musician Jonas Gwangwa formed the temporary group of musicians that would later serve as the inspiration for Amandla. Alongside this group’s success, Thabo Mbeki and other ANC members pushed for a permanent cultural group for the anti-apartheid struggle, leading to the formation of the Amandla Cultural Ensemble in 1978. Originally composed of members recruited from military camps in Angola who were already writing and singing liberation songs, the disciplined performers expounded upon their creativity the more they got to perform. After the first tour in 1980, the performers were no longer novices and in fact great performers during their second tour in 1983. Mabuza speaks of the importance of this group, claiming that when one did not understand or listen to a political speech, they surely could not walk away from these performances without the heart of the struggle piercing them. In 1982 Mabuza moved from the behind-the-scenes organization of cultural events and “took the stage” so to speak to participate actively in the Culture and Resistance conference. The conference, backed by the Scandinavian countries, was held in Gaborone, Botswana. Over 1,000 cultural workers, 800 of whom were South Africans, converged to speak out for a cultural boycott of apartheid policies. An exposition of artwork and photographs lasted three months, from June to August, and the symposium itself took place directly in the midst of this, on July 5-9. The symposium consisted of many different things—it practically dominated the University in Gaborone and trickled throughout much of the rest of the town as well—including films shown in the afternoons, plays and concerts available in the evenings, and discussions and debates on various forms of cultural expression throughout. Mabuza’s name can be found amongst the contributors of formal papers to the symposium. We can imagine that Mabuza would have been overwhelmed with pride at her companions organizing such a feat in the name of African culture. However, the group still had a long way to go. Critics of the symposium argued that it was too broad, that its grandiose extent diluted the organizers’ original goal. Later on, though, similar conferences, including the Culture for Another South Africa conference, proved more successful in the critics’ eyes, showing that the cultural resistors were, in fact, learning as they went along. After experiencing much success with cultural expositions—and after receiving praise for Malibongwe, the collection of poems written by African women—Mabuza and her colleagues continued in their efforts. Now they moved on from poems and focused instead on short stories. The Swedish Agency for International Development partnered with them on this endeavour, broadening the audience they reached and making a competition out of it in certain areas. As a result of the agency’s influence, they received eight hundred submissions, many of which spoke out on issues surrounding sexual abuse by men. Published in 1989, One Never Knows: An Anthology of Black South African Women Writers in Exile is most likely what this collection became, edited by Mabuza and closing with a story by Mabuza herself, entitled ‘Wake…’ Many of the stories within the collection reflect the style of the Black Consciousness Movement as well as the similar American Black Arts Movement, but Mabuza’s story deviates from this style. Mabuza blends writing styles, writing in a less conventional manner that cannot be traced along a simple chronological plotline. She writes about the survival of her people, focusing on the story of the family of two girls who were killed in Soweto. Stories such as these are important examples of the importance of the written word in any rebellion. They give a different kind of life to the voices of the people affected, giving these people—victims—an empathetic word, and reaching out to the enemy in a less conventional way in hopes of helping them to understand the victim’s struggle. Mabuza praised these cultural movements, saying ‘we created a climate that was impenetrable by any voice that was contrary to ours’. This climate was only strengthened with yet another outburst of cultural display at a gala held in Gothenburg, Sweden in 1985 for the ANC. Through all of these events, Mabuza and her colleagues reached a number of people who possibly would not have supported the liberation movement otherwise, much to the anguish of the apartheid government. After working in Scandinavia for a time, Mabuza returned to the USA in 1986  to continue her work for the ANC in the country that greatly influenced her choice to join the ANC in the first place. She ‘crisscrossed that country making a case for one man, one vote,’ a notion that might have seemed all too obvious in the USA but the simple pleasures of which were being snatched from Africans in their own land. It was perhaps this familiarity with the concept of all men being able to vote in a democratic society that made Mabuza’s work in America all the more trying. She had to make Americans see the value of a vote that they most likely took for granted in order to convince them of the importance of South Africa’s liberation struggle. In fact, for a while, American politics were inclined to support the apartheid regime rather than those fighting against it. To first impose sanctions against South Africa in 1986, the Congress had to override a Presidential veto. After Nelson Mandela’s release from prison in 1990, many countries wanted to lessen (or withdraw) their sanctions against South Africa. Mabuza called for America to refuse to do so. She lobbied for continued international pressure against South Africa, stating her gratitude at American President George H. W. Bush’s inclination towards maintaining their sanctions. However, these sanctions were later lifted in 1991, despite the Mandela’s protest. The arms sanction against South Africa remained in place until 1998. In 1994, South Africa held its first democratic elections where all eligible South Africans were able to vote. At the polling booth in South Africa, Mabuza paid homage to the land she lived in for so long, the land she lobbied within to garner support for South African freedom fighters—the United States of America. An American reporter described his encounter with Mabuza as she stepped up to cast her own vote after finally winning the vote. He speaks of her pure joy at having the ability, the way she simply exclaimed, “‘intoxicating,’” after casting her vote. He speaks also of her critique of the Americans who let cynicism and entitlement pervade their democratic duty. She tells them not to give up on the principles of democracy, that “‘if they care about themselves, they must vote’”. Mandela. Mabuza went abroad once more, intent on continuing her influence in yet another land. Now, though, rather than her objective being to stop exchanges between South Africa and foreign countries, she worked to promote trade and cultural exchanges with South Africa. Though working from a different angle now that South Africa was a democracy, Mabuza’s goal was still the same: to improve the quality of life of her fellow South Africans. In 2004, ten years after the first democratic election of South Africa, individuals who contributed ‘towards building a non-racial, non-sexist, democratic and prosperous South Africa as envisaged in the Constitution’ received National Orders. Mabuza received a Presidential National Order for her work in utilizing arts and culture to achieve democracy, an excellent culminating remark to acknowledge all that Mabuza dedicated herself to throughout her life and the great impact she made for all South Africans, and women, especially. Dyer, M. 1982, Culture and Resistance, Digital Innovation South Africa. Available from: http://www.sahistory.org.za/archive/culture-and-resistance-cynthia-kross . [27 October 2016]. Kempster, N. 1991, ‘Bush Lifts Economic Sanctions on S. Africa : Apartheid: He sees ‘irreversible’ progress by Pretoria. Opponents in Congress plan no effort to undo the move.’, Los Angeles Times, 11 July. Available from: http://articles.latimes.com. [07 December 2016]. Mabuza, L. 1990, ‘The War on Apartheid is Far From Over’, New York Times, 20 June. Available from: http://www.nytimes.com. [27 October 2016]. Mbeki, T. 2006, Oration of the President of South Africa, Thabo Mbeki, at the Funeral of Ellen Motlalepule Kuzwayo, Soweto, South African History Online. Available from: http://www.sahistory.org.za/archive/oration-president-south-africa-thabo-mbeki-funeral-ellen-motlalepule-kuzwayo-soweto [25 October 2016]. Milloy, C. 1994, ‘The Value of the Vote’, The Washington Post, 27 April. Available from: https://www.washingtonpost.com. [27 October 2016]. Samuels, A. 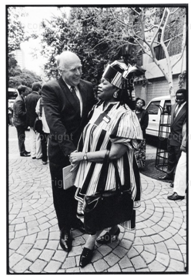 1990, ‘Peace Still Elusive, ANC Aide Says : South Africa: The African National Congress delegate to the U.S. tells a Chapman College audience of reforms still needed in her homeland.’, Los Angeles Times, 14 March. Available from: articles.latimes.com. [25 October 2016]. Selström, T. 2002, ‘Interview with Lindiwe Mabuza’ in Selström, T (ed) Liberation in Southern Africa—Regional and Swedish Voices, pp. 134 – 142., Elanders Gotab, Stockholm. Available from: http://www.liberationafrica.se. [27 October 2016]. Sibanyoni, H. 1988, A Tool of Liberation or a Tool of Censorship?, South African History Online. Available from: http://www.sahistory.org.za/archive/cultural-boycott-tool-liberation-or-tool-censorship-speech-given-hazzie-sibanyoni [06 December 2016]. Upton, E. M. & Mabuza, L. 1995, ‘Born to the Struggle, Learning to Write: An Interview with Lindiwe Mabuza, Poet and Chief Representative of the African National Congress (of South Africa) in the United States’, Feminist Studies, vol. 21, no. 3, pp. 615-627. Available from: JSTOR. [27 October 2016]. Weiner, T. 1998, ‘U.S., After 35 Years, Lifts Arms Embargo Against South Africa’, New York Times, 28 February. Available from: http://www.nytimes.com [07 December 2016]. Flockemann, M. 1992, ‘Tradition and Transformation: One Never Knows’, Tulsa Studies in Women’s Literature, vol. 11 no. 1, pp. 113-123. Available from: JSTOR. [27 October 2016]. Gilbert, S. 2007, ‘Singing Against Apartheid: ANC Cultural Groups and the International Anti-Apartheid Struggle’, Journal of South African Studies, vol. 33 no. 2, pp. 431. Available from: JSTOR. [06 December 2016]. Franks, P. 2016, Memorandum on the Culture and Resistance Symposium-Festival of South African Arts, Gaberone, Botswana, July 1982, with a Postscript (2016), Academia.edu. Available from: http://www.academia.edu/. [27 October 2016]. Massaquoi, H. J. 1996, ‘South Africa’s First Black Ambassador to Germany’, Ebony. Available from: Southern Methodist University Microform. [27 October 2016]. South African History Online. 2011. Diplomatic Office of the ANC in Stockholm is Bombed. [ONLINE] [Accessed 27 October 2016]. South African History Online 2014, National Orders Recipients 2014, South African History Online. Available from: http://www.sahistory.org.za/article/national-orders-recipients-2014 [27 October 2016]. United Nations High Commissioner for Refugees. 2016. Mabuza, Lindiwe. [ONLINE] Availabe at: http://www.unhcr.org/. [Accessed 07 December 2016].